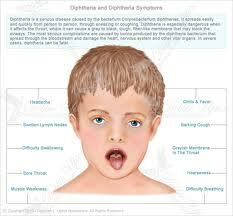 Diphtheria is an acute infection caused by corynebacterium diphtheriae that usually attacks respiratory tract but may involve any mucus membrane or skin wound. It Spreads by respiratory secretions. Age: although it is considered as a disease of childhood but it is increasingly affecting adults due to non- immunization in childhood. Local manifestations are due to pseudo-membrane while the systemic manifestations are due to formation of exotoxin. However the presence of pseudo-membrane is not essential for diagnosis. Exotoxin produced by the organism is responsible for myocarditis and neuropathy. It is characterized by the presence of unilateral, serosanguineous nasal discharge that crusts around the external nares. 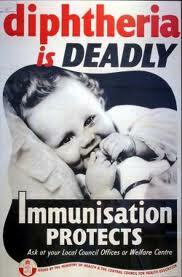 It is the most common type of diphtheria and is associated with the greatest toxicity. It is characterized by marked tonsillar and pharyngeal inflammation and the presence of pseudo-membrane. This tough grayish yellow membrane is formed by fibrin, bacteria, epithelial cells, mononuclear cells and polymorph and is firmly adherent to the underlying tissue. Regional lymph nodes are enlarged and tender producing so -called "bull- neck". Laryngeal diphtheria causes husky voice brassy cough and later dyspnea and cyanosis due to respiratory obstruction. Myocarditis develops often weeks later in with pharyngeal or laryngeal diphtheria. Palatal and pharyngeal wall palsy. It is usually associated with bums and in poor personal hygiene. Diagnosis is clinical but can be confirmed by culture of the organism. 2. Adult type toxoid (Td) in adults. 1. Complete isolation of patient, bed rest. 2. Anti-toxin prepared from horse serum for all cases when diphtheria is suspected. It must be given early because to prevent further fixation of toxin to tissue receptors, since fixed toxin is not neutralized by anti-toxin. 3. Removal of membrane by direct laryngoscopy or bronchoscopy may be necessary to prevent or alleviate airway obstruction.